When and where in Russia to see the northern lights. The northern lights appear every winter over Lake Lovozero , lost somewhere in the Kola Peninsula beyond the Arctic Circle. The Russian Saami who live on its shores tell fortunes, drawing on the Arctic sky as if it were a cup of coffee. The entire polar north of Russia watches this unusual natural phenomenon – even hunters rush to conquer the vast expanses of Yakutia, Chukotka and the Krasnoyarsk Territory, in order to glimpse the northern lights. 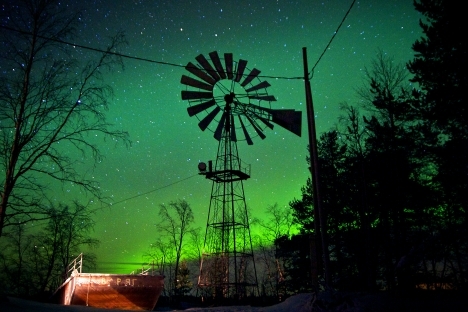 In the north of the Kola Peninsula the northern lights can be seen up to 200 times a year. The main part of the peninsula is located beyond the Arctic Circle, so, in summer, the sun does not set beyond the horizon for about 6 weeks, and polar nights reign in the winter. At Lapland Reserve, local people find the northern lights in the midst of 600-year old trees, Saami pagan monuments and sacred lakes. The best time to observe the phenomenon is from February to March or September to October, when the fiery glow in the sky can last anywhere between several hours and several days. The most common color radiance here is pale green, red and, sometimes, purple. This nuclear shipbuilding center claims the status of a Russian science city. Severodvinsk attracts travelers with some of the brightest northern lights in all of western Russia. Located near Arkhangelsk, it provides more opportunities to study this natural phenomenon than the region capital: you do not even have to leave the city to see the bright green-and-red glow in the middle of the winter sky. If you receive a special permit, you can travel to the archipelago of Novaya Zemlya, which is now home to about 3,000 people who are mostly military men and builders. For a long time in the 20th century, Russia conducted peaceful nuclear tests here; this was the place where the Tsar Bomb AN602 - the most powerful device ever detonated in the history of mankind - was dropped for the first time. During polar nights, most islands are used for herding reindeers, which are often out strolling in the rays of scarlet northern lights. "Never whistle, if you see the northern lights! It will immediately disappear,” as they say in Naryan-Mar, the capital of the Nenets Autonomous District in the north of Russia. Here, there is a monument to the first Russian city that was built in the Arctic – Pustozersk , founded in 1499. In the 16th century, Pustozersk became a major Russian outpost in the north and in Siberia, and it often served as a place of exile and imprisonment. A prominent figure revered as a holy martyr by adherents of the Old Belief, Archpriest Habakkuk, was burned at the stake here. When more convenient routes to Siberia through the Ural Mountains were opened in the 18th century, the outpost lost its value, and, in the 20th century, completely disappeared - the Pustozersk church frame was transported and is now located on the outskirts of Naryan-Mar. The structure has only the outlines of the old temple and is used for everyday purposes now. The best time to visit the region to see the northern lights and to listen to the legends of the vanished city is in the early fall. Salekhard is the only city in the world that is located on the Arctic Circle. Northern lights are everywhere – people give the name Ployarnoe siyanie(Polar lights) to all kinds of supermarkets, cinemas, local media and travel agencies. Moreover, if you venture farther into the northern tundra, you’ll be able to see the bright green glow in the sky that the local people call Nger Harp – “the light of the dead”: the Nenets believe that on cold nights the souls of their ancestors go hunting through the tundra. Dixon village is located in the north of Krasnoyarsk Territory; one part of it lies on the mainland and the other - on an island of the same name, which is separated from the continent by a one-mile strait. This is the northernmost port of Russia; there is also an airport on the island. The North Pole is only two hours away by plane- in August the temperature here rises no higher than 43 degrees Fahrenheit. There are also no more than 30 sunny days a year here, but the 632 residents of the island get to enjoy the astonishing white lights of the aurora borealis in late summer. Dudinka is located beyond the Arctic Circle, where above-freezing temperatures are observed only during four months of the year; in the winter, temperatures drop to -58 degrees Fahrenheit and, in the summer, can reach 86 degrees Fahrenheit. Those who take the plunge and visit the city experience arctic landscapes, impressive icebreakers on the horizon and northern lights that stay in the skies for at least 8 months. In a zone of permafrost, to the northeast of the Krasnoyarsk region, there stands the town of Igarka– a port on the river of the same name. The port town owes its name to one of the local residents - fisherman Yegor Shiryaev, whose name was altered by his neighbors from ‘Egorka’ into ‘Igarka’. The village was the last stop on the Northern Railway - Joseph Stalin’s project designed to unite the communities of the far north through a Salekhard-Igarka railway route. Walking along the “dead road” - as it's called now – should be an obligatory point on the list of any traveler who is looking for an adventure. In spring and autumn, emerald-colored northern lights can be seen in the sky above Chum and Igarka every night. In one of the northernmost towns in Russia, there are too many attractions for the 2960 residents. The most surprising of these are two mammoth museums (one of which is constructed underground), a ship graveyard and an abandoned diamond mine. Here stands the largest Orthodox Church in northern Eurasia - the Church of the Epiphany. During polar nights, the brightest northern lights illuminate the sky above Khatanga; people come from all over Russia to see it. There is a direct flight from Moscow to Tixi, whose airport plays an important role in connecting the major cities of Russia with lost Yakut settlements. In 1930, this settlement was founded at 72 degrees north latitude by meteorologists, mariners and pilots. Here, the polar night lasts two and a half winter months, as does the polar day. Northern lights are especially visible in the vernal and autumnal equinoxes of April and October, respectively. Nine miles away from Magadan the color of the sky changes dramatically – the entire sky lights up with a grass-green glow that is reflected in the snowdrifts. Magadan citizens say the northern lights give them “summer snow” by painting everything around in bright colors. Magadan is located in the Russian Far East, on the shore of the Sea of ​​Okhotsk. It is located on the same latitude as St. Petersburg, and the harsh climate and the presence of the northern lights are conditioned by the cold seas and mountains nearby. The northern lights cannot be observed here too often, usually only in March or April, before the polar summer. Wrangel Island, with its endless expanses of Arctic tundra, is part of the UNESCO World Heritage Site nature reserve of the same name. The island is located at the junction of the Eastern and Western hemispheres, separated into two nearly equal halves by a 590-foot meridian. On the island there are no housing units - all three of the villages that were built here in the 20th century do not exist anymore. You can book a tour of the nature reserve to visit the park and enjoy the sight of grazing musk oxen, the northern lights reflected in deposits of rock crystal and the decaying buildings of ghost towns.